A couple of weeks ago I did what I normally do every Saturday morning, and that is to wake up early, jump on my bike, and head to the farmer’s market. I get the best of both things, riding my bike before most folks are awake, and talking to the farmers at the market. This particular morning yielded shallots, baby yukon potatoes, and fresh eggs. Don’t even get me started on how great the eggs are, and for that matter, pretty much anything you pick up from the market. So as I cruised home, I was still the only one awake, and decided to make a nice breakfast for my wife. My wife actually turned me on to this style of breakfast when we were first married. She loved thinly slicing potatoes, and onions, only to be lightly browned, then eggs added to finish it off. I’ve taken that concept and turned it into my own version, and so I wanted to give back, if you will, an offer her up a farmer’s market breakfast, hence where the potato and ham frittata comes into play. Start by getting a oven proof skillet onto the stove, on medium heat. Add in the butter, and let the butter fully melt. 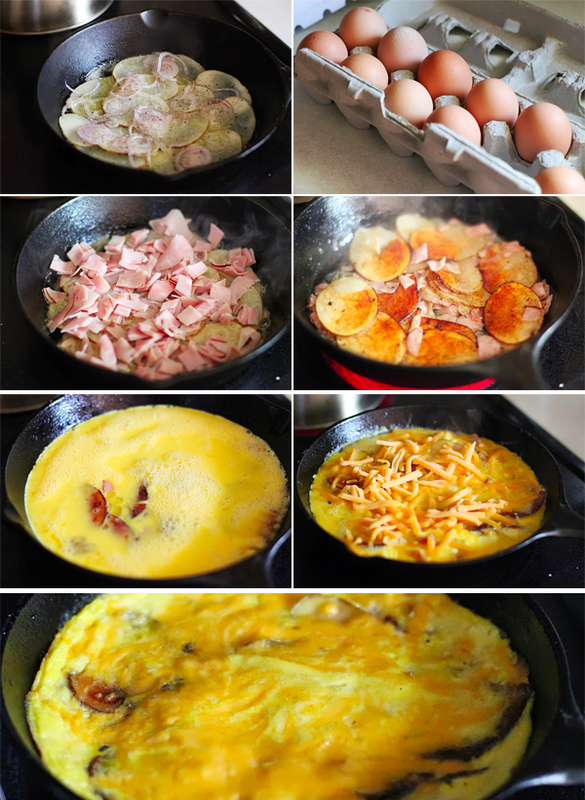 Layer the thinly sliced potatoes on the bottom of the skillet, and let this cook for about 5 minutes. Top with the thinly sliced shallots and sprinkle with salt and pepper. Top with the ham. Flip the potatoes to get the ham and onions cooking on the bottom now. You can do this with your amazing flipping skills, or place large plate over the skillet, turn onto the plate, then slide the mixture back into the skillet. Your call. Next add the beaten eggs, pouring over the potatoes. Top with the cheese, then add into the preheated oven, cooking until the eggs have set and the cheese is nice and golden. Remove from the oven, and let cool for about 5 minutes before slicing into wedges. Who am I kidding, it was a small skillet, so I sliced in half and had breakfast with my wife. 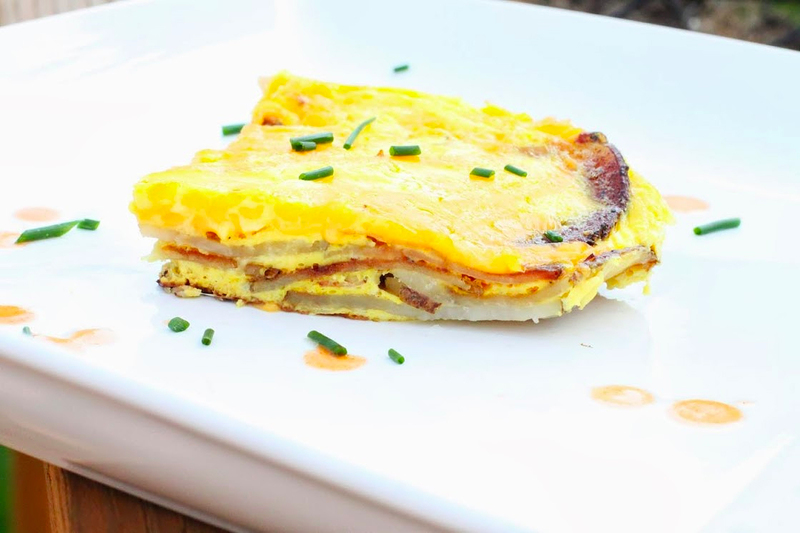 At first glance you would think it is just a simple, baked omelette of sorts, but then you get those layered potatoes, along with the ham and onions, that with every bite you want more. I garnished ours with a bit of fresh chives from the garden, and a drizzle of hot sauce.